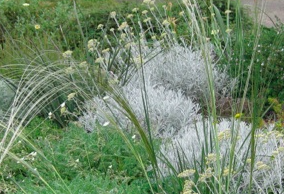 Useful and tough shrub that is the whitest gray that you can imagine. Evergreen plant that forms a rounded shrub to 2′ x 3′. In summer tall spikes carry umbels of striking gold flowers. Very pretty. Adapted to the absolutely poorest soils and thrives without any appreciable irrigation. It may be cut back hard after flowering for a more compact plant. First rate foliage plant for contrast that does not rat out or go funky as older Lavender plants can. Extremely cold hardy and drought adapted. Native to Mongolia.